Only a modest amount of archaeological investigation has been conducted into Grenada’s pre-colonial Amerindian past, but the few efforts made since the 1960s are noteworthy. Ripley Bullen did the first archaeological survey of Grenada, in which he identified cultures that pre-date the appearance of the Taíno in the northern Caribbean. This evidence occurs at the sites of Pearls (near Grenada’s airport), La Filette, St. Johns River, and Simon Beach. The earliest material culture assemblages were dated between A.D. 1 and 700 and therefore coincide with the later stages of Saladoid migrations from Venezuela into the Caribbean region. At present it appears that Saladoid groups were the first to inhabit Grenada, and their sites, as in every island they settled, are easily recognized. The settlement of Pearls has yielded pottery with zoomorphic adorno decorations and greenstone figurines of frogs. Pearls had a long period of occupation from c. 300 B.C. to A.D. 400. Recent investigations into Saladoid technologies indicate that Grenada was involved in the Saladoid regional lapidary trade network, since its amethyst deposits were exploited at this early time. Saladoid peoples here specialized in the manufacture of lithic (stone) beads, some of which were used in inter-island trade. A second pre-colonial phase was identified from Bullen’s early work, that of the Suazoid culture, dating from A.D. 1000 to 1450. The Suazoid label that is applied to all similar cultures in the Caribbean takes its name from the type-site of Savannah Suazey located in Grenada. This period is characterized by coastal settlements or sites near mangrove swamps, the latter of which were exploited for their food resources. Remains of molluscs, fish, and turtles have been identified in Suazoid sites. These peoples were not the ones that Columbus met when he arrived in 1498—they had disappeared before this time and were likely displaced by Carib groups in relatively late migrations from South America. Carib populations then, comprised the third and final indigenous occupation of Grenada. Carib peoples successfully resisted all attempts at colonization until 1650 when the French landed, dispatching most of the local indigenous population within a few years. French settlement, which lasted until 1763, saw the beginnings of plantation economies in Grenada, including sugar cane, coffee, tobacco, indigo, and cocoa crops, as well as the importation of African labor. The British fought the French for possession of the island in a series of campaigns that saw Grenada change hands repeatedly until 1783, when the Treaty of Versailles gave Britain ownership of the island. It was during the British occupation that the spice crops of mace, nutmeg and clove were introduced into Grenada, which resulted in a highly successful spice industry that persists to the present day. 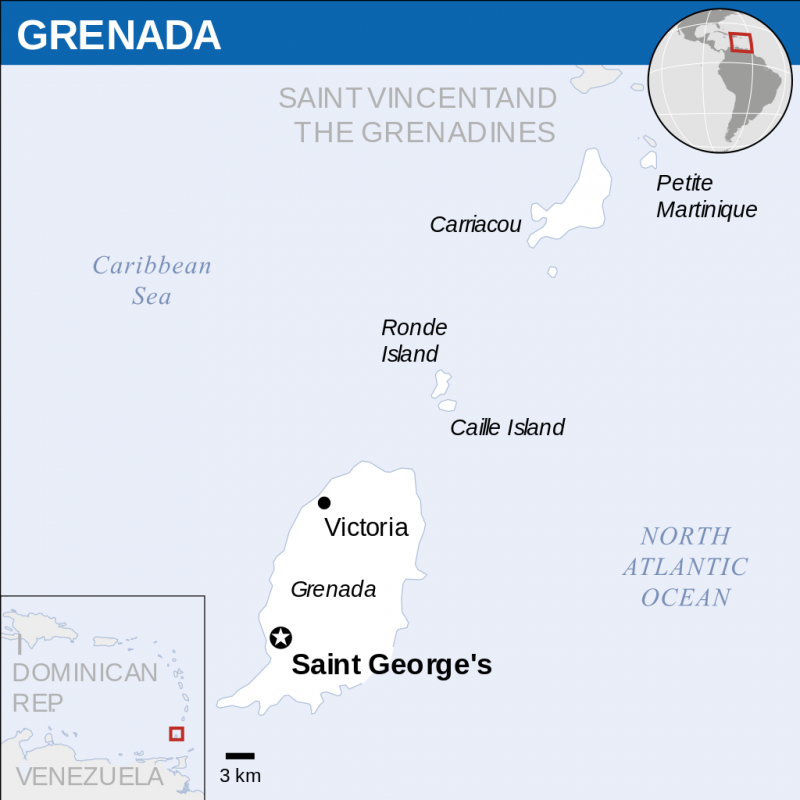 Known as ‘Spice Island,’ Grenada produces almost half of the world’s annual crop in nutmeg. Punctated opossum adorno, unknown site, Grenada, 1in. length. Florida Museum of Natural History, Gainesville,Florida. Photograph by Lawrence Waldron 2011. 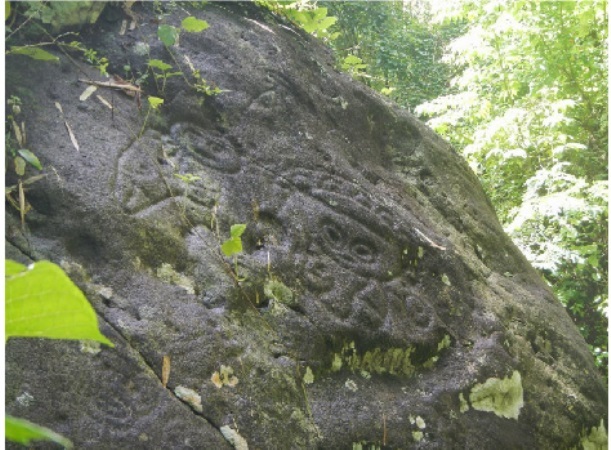 Petroglyphs at Mount Rich, Grenada. Westerhall Estate, St. David's, Grenada. 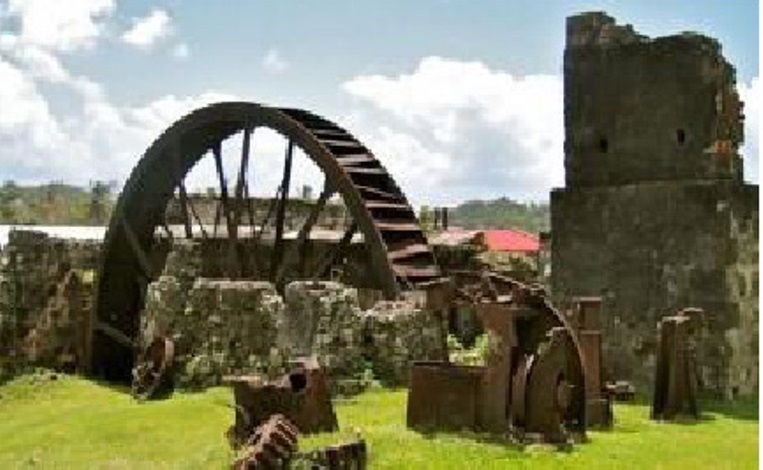 The attractions listed below are a great way to learn more about the history, culture, and heritage of Grenada. At River Antoine Estate in St. Patrick's, workers make rum following traditional methods, including using a water-wheel powered cane crusher and the original 18th century fermentation room. 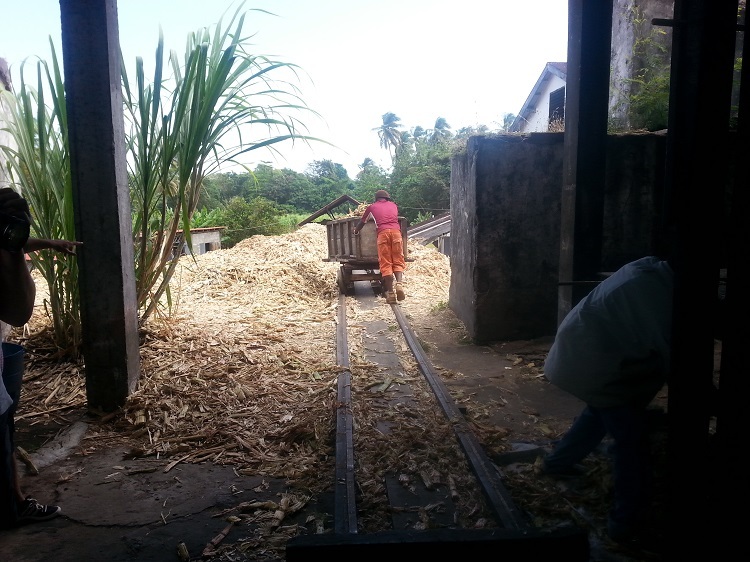 In this photo, a worker wheels the spent stalks or “bagasse” in a handcart to the compost pile. 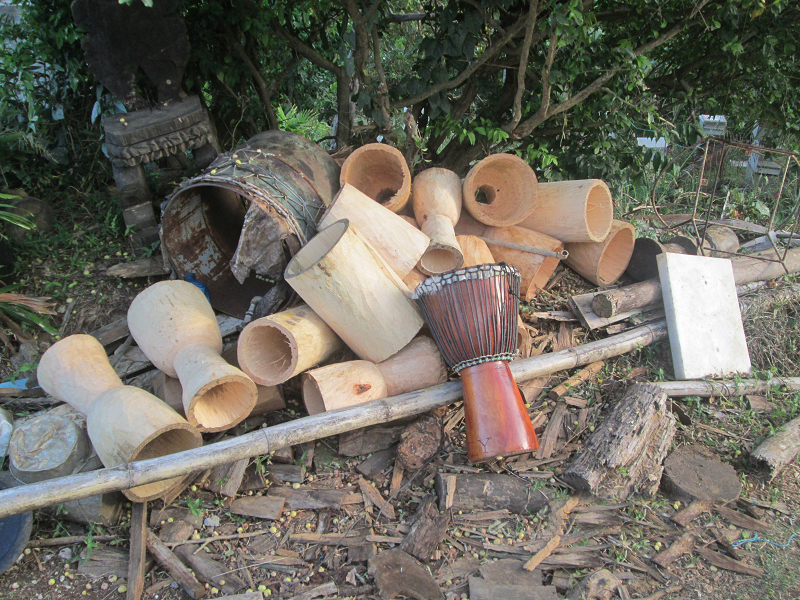 Below you will find a selection of popular Grenadan traditional craft establishments. 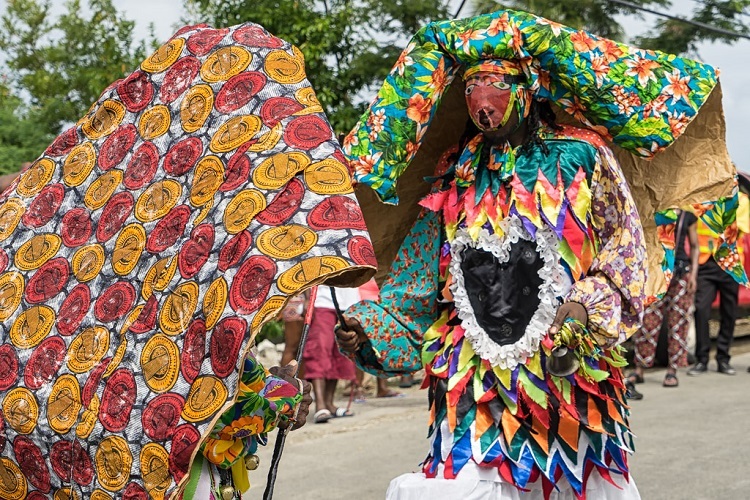 Here is a list of some festivals held in Grenada. 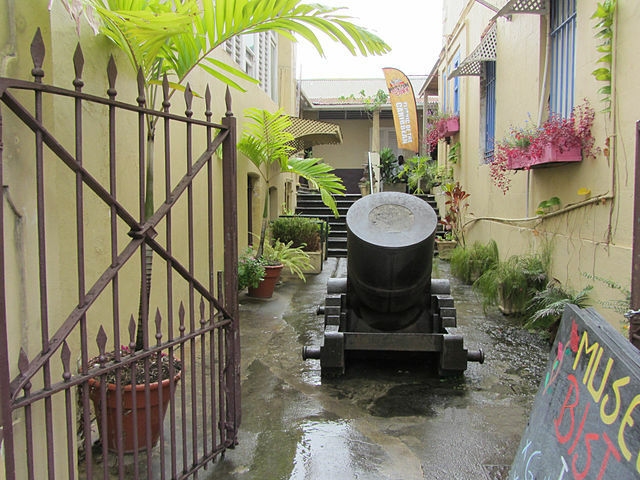 Click on the links below to learn about museums and heritage organizations in Grenada. There are several ways to start your career in heritage. Please click on the links below to view the academic opportunities based in Grenada.